Although it looks like an ordinary statue, it attacks with no warning. Immune to magic, it can attack from any range. Parry its attacks for a chance to use reaction commands. A sword-bearing statue. It unleashes a fearsome attack when its HP is low, so use a powerful Medal to stop it stone-cold! 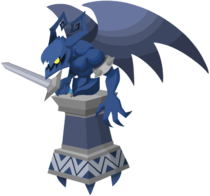 The Gargoyle Knight is a Pureblood Heartless that is found in Kingdom Hearts II. 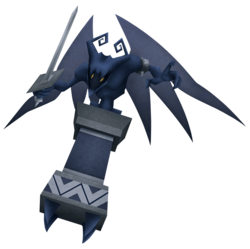 It is actually an ordinary statue that is under the control of a Possessor Heartless. It hides among regular gargoyle statues, and appears suddenly to attack. It attacks by slashing its sword. Slow as they are, Gargoyle Knights are immune to magic spells. They can also fly and swoop down blade-first, making them all the more dangerous. A Gargoyle Knight is a statue with a tall, rectangular pedestal colored in various shades of grey. It has four steel grey spikes in its base. The actual statue is the upper body of a thin, muscular gargoyle with steel blue skin and wings of the same color. Each of its hands has four clawed fingers, and it wears a grey armlet with silver spikes on its upper left arm. The gargoyle's head is roughly triangular in shape and sports large, angular horns that curve inward. Its face is black and it has small, yellow eyes. It also wields a grey sword with a diamond-shaped guard and a spiked pommel. The Gargoyle Knight's name refers to the creature the statue is modeled after. "Knight" may reference the fact that it carries a sword, as opposed to the Gargoyle Warrior. Its Japanese name, "Sword Statue", is a much clearer reference to the fact that it is actually just a possessed statue that wields a sword. Continuous Slash (連続斬り, Renzokukiri? ): Triple sword slash. Falling Slash (落下斬り, Rakkakiri? ): Sword thrust during drop. Rising Slash (上昇斬り, Joushoukiri? ): Upward swing while rising. Repeating Slash (反復斬り, Hanpukukiri? ): Double-charge and slash. This page was last edited on 2 May 2018, at 17:45.